This hotel is located in the heart of Paris. 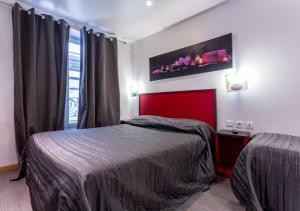 It is 10 minutes from Gare du Nord and close to the theatre district and shopping strips. It offers free Wi-Fi. Some rooms at the Victory Galou are equipped with bathrooms and all feature a TV. This hotel offers a 24-hour front desk service. A continental breakfast is served daily. Its central location allows for easy access to all of the cities sought-after tourist destinations whether on foot or using public transport such as, Chateau d'Eau Metro Station, which is 250 metres or Strasbourg St Denis Metro Station, which is 280 metres from the hotel. Guests have a 25% discount for a public car park, located a 5-minute walk away. Guests arriving after 18:00 are kindly requested to inform the hotel in advance. Contact details can be found in the booking confirmation. A TV is provided. This room has access to a shared bathroom. Rate: € 41.36 ... € 159.00; select dates below to get current rates. Rate: € 52.51 ... € 156.00; select dates below to get current rates. Rate: € 40.48 ... € 154.00; select dates below to get current rates.